Posted on Tuesday, November 19th, 2013 at 10:44 am by Pieter van der Westhuizen. I’m sure by now you are all aware that Microsoft removed all Visual Studio Installer project types with the release of Visual Studio 2012. A suggested alternative to creating setup files was to use the very powerful and flexible WiX toolset. 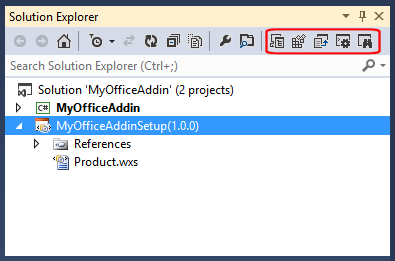 The one big problem, with switching over to WiX for your setup project was that, a lot of people already invested a considerable amount of time building a setup using the Visual Studio Installer project. Completely rebuilding the setup using WiX was something not many people were looking forward to and understandably, are very upset about. Add-in Express came to our rescue in this scenario by providing us with a great, although subtle, add-in for Visual Studio called the VDProj to WiX Converter. This little gem enabled developers to convert their existing VDProj setup projects with one click. A couple of months later, WiX has become the new ‘norm’ and everyone was happy, right? Well, yes and no. Although WiX is great, you need to build the setup using XML and it can be both a time consuming and error prone activity. I for one, have gotten used to quickly and easily building my setup projects using the old Visual Studio VDProj projects and I’m sure so too have many other developers. Once again, Add-in Express stepped up to the plate and came to the assistance of many developers by building the Designer for WiX toolset (aka WiX Designer)! How does the WiX Designer work? Each one of these editors will sound and look very familiar if you’ve ever built a VDProj setup. Let’s take a look at each of them. 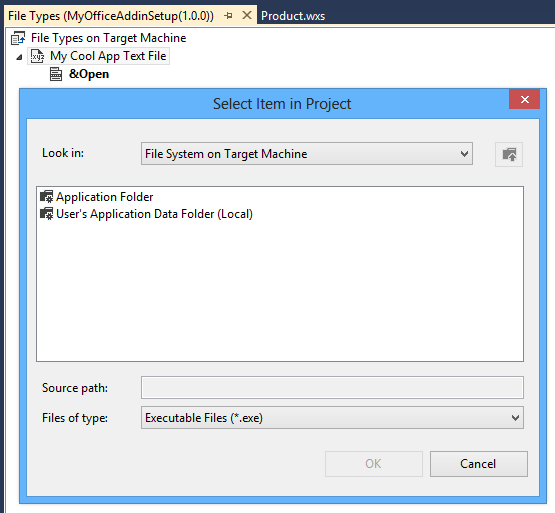 Using the File System Editor, you can create folders, add files and even create shortcuts on the target machine when installing your application or add-in. Using the WiX Designer’s File Type Editor you can specify file associations on the target computer as well as verbs to identify the actions allowed for the file type. When adding a file type, a dialog window will open with which you can select the file from either the Application Folder or the User’s Application Data folder. Once selected it will be added to the list of file types in the Fie Type editor and you can specify additional actions for the file type. <File Id="_28C09903_FEA8_4570_8A19_29B7C7B1BD9D" DiskId="1" Hidden="no" ReadOnly="no"
The last editor on our list is the Launch Conditions Editor. I’m sure you’re already familiar with the concept of launch conditions, but in essence it checks for certain requirements to be met before the installation can continue. As common use for this is to check whether the correct version of the Microsoft .Net framework is installed on the target computer. With the Launch Conditions Editor you can add new launch conditions and also specify the condition using the Visual Studio properties grid. I’m hoping you’re as excited about this new product as we are, and we’re sure this will be another valuable addition to your development tool belt! The release version of the WiX Designer is published. Check out new exiting features for your WiX setup projects! Could you please send your project (or some other test project with the same behavior) to our Support team? You can find our support email address in the readme.txt file located in the product installation folder. We will try to find and fix the issue. at the ‘Just one more step to complete’ stage. Can you shed any light on this please. Thank you for your interest in our new product! I think something is wrong with the code that connects to our activation server, it looks it does not recognize your proxy’s settings. Please choose “Manual activation” instead of automatic and use your browser to obtain an activation code. If you have any difficulties, please contact our support team and our guys will generate the activation code for you. 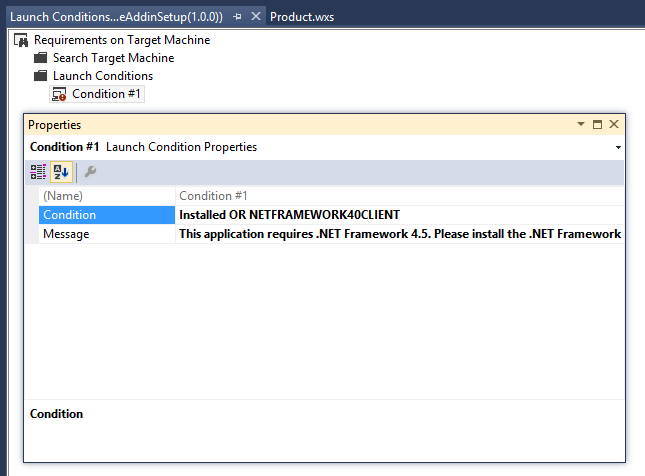 This will definately get me to use VS2013 which I skipped because of the missing deployment/setup tool. The WiX seems to be a good tool – I just don’t like all the configuration and this is my way out. I will probably end up buying this when it RTMs. I spend most of my time programmring Windows Services. But I get an error (same error *8) when trying to use this add in with Windows Services. New Project > Windows Service > Add project > Wix Setup > Right click the service and Add Installer. Configure the add in > add Primary Output > Add the Primary Output to the Install, Uninstall, Rollback and Commit, and you’ll get the above mentioned error. Unfortunately, the XML for your Product.wxs file was removed by our blog comment system. It does not like greater than and less than characters. I have just tried to create a WiX setup project containing a Windows Service project following your steps. The project builds successfully on my side, I cannot reproduce the error. I am using VS 2013, WiX 3.8 and WiX Designer Beta 2. Could you please send me your project for testing? You can find our support email address in the readme.txt file located in the WiX Designer installation folder. Sure thing! I’ll send you my solution. Its VS2013, VB.NET WiX3.8, WiX Designer BETA 2. When choosing Add>Project Output…, take the correct project in the project combobox and select Primary Output it will only take the exe and the config file but all other assemblies which are also needed are not taken. How is it possible to configure to take also all the dependent assemblies? We have already discussed this issue and will try to implement a feature that will add all dependencies automatically. 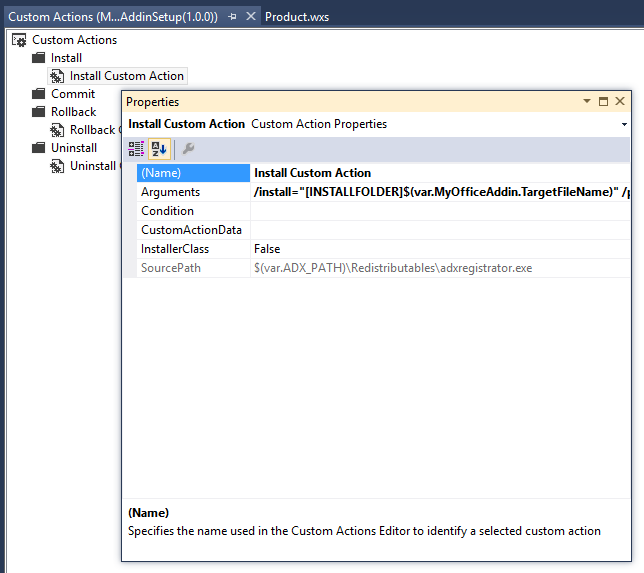 As for now, you have to add the required assemblies manually by using the Add -> File… context menu item. Sorry for the inconvenience. I have converted the vdproj to wix project using converter but the services coded in my installer file is not running after install.Plz resolve it. I am afraid I do not quite understand what “services coded” mean. May I ask you to send your project (or a sample project with the same issue) to our support service? You can find our support email address in the readme.txt file located in the VDProj Converter installation folder. This occurs if your installer creates a file and the file isn’t deleted by the moment when the .MSI tries to delete the folder. Or, maybe, you modify an installed file.